100 o Ganeuon Pop/Welsh Pop Songs, in 'busker' format of vocal line + guitar chord indications - a unique resource. Gol. / ed. Meinir Wyn Edwards. Y Lolfa, 2010. 9781847712417. Llais + chordiau gitâr / voice + guitar chords (n.b. HEB PIANO / no piano accompaniment). 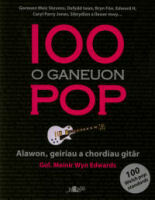 Geiriau Cymreig yn unig / Welsh lyrics only.